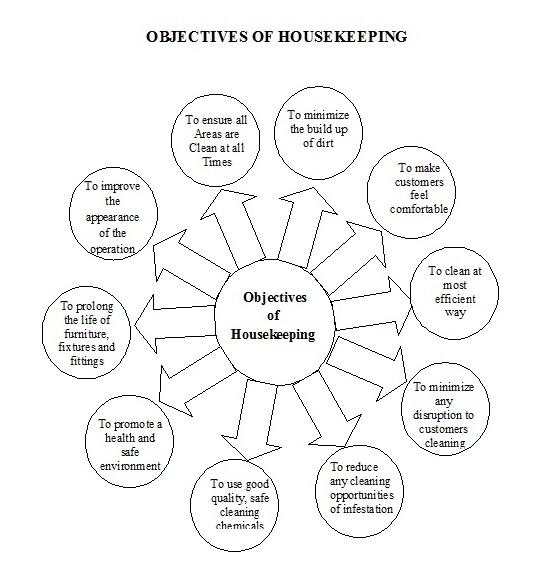 The basic concept of housekeeping has started from keeping of a domestic house clean and has gradually come to maintaining high standard of cleanliness and maintenance of commercial levels, besides the housekeeping should also contributes to the saving in costs of labour, cleaning material and equipment. Housekeeping is an important and integral part of the guest experience and satisfaction. The impact of the housekeeping function on the success of a hotel’s operations cannot be underestimated, since large revenue for hotel industry is generated mainly from the sale of rooms. The housekeeping is the department of a hotel charged with cleaning and maintaining rooms and public spaces. From the time a guest checks-in in a hotel till he checks out, it is the housekeeping department which takes care of the guest by making his / her stay pleasant and comfortable. In general, the housekeeping crew is responsible for the daily cleaning of public rooms (lobbies, corridors, meeting rooms), private bedrooms and public washrooms. In addition, it handles the laundering of linens and in some instances, guest laundry. Housekeeping also performs a minor security function by providing a “first alert” to potential guest problems while staff undertake daily guest bedroom cleaning. Housekeeping in simple words means maintaining a house on a daily or long term basis or looking after its cleanliness, unkeep and smooth running, at the same time check all the fixtures like taps, geysers, electric wiring, bulbs, tubes, fans, plug point are in good working conditions. In other words, we may also say that housekeeping is a process of keeping a place clean, beautiful and well maintained so that it looks and feels pleasant inviting to all, either living, visiting or working there,. 1) Comfort: It is the duty of the housekeeping department to ensure comfort and a welcoming atmosphere to the guests as well as strive to extend courteous, reliable and satisfactory service from staffs of all departments. 2) Cleanliness and Hygiene: A high standard of cleanliness and general upkeep in all areas. Clean and well maintained areas and equipments create a favorable impression on the guest. 3) Privacy: Housekeeping staffs ensure the privacy of the guests and they should be trained with proper procedures to enter the room. 4) Safety and Security: The housekeeping department staffs should ensure the safety and security of the guests with the help of security services. 5) Décor: This work is an art and the housekeeping staff is mainly responsible for creating a pleasant atmosphere. The main functions of housekeeping are overall cleanliness, bed making, ensuring maintenance of the building and its infrastructure, laundry, linen management, key control, pest control, safety and security of the guests as well as the infrastructure and interior decoration. All this ensure the ambience and promotes a congenial environment. Apart from cleaning the guest rooms, housekeeping department is also responsible for cleaning floor, terraces, elevators, elevator lobbies, corridors of guest floors, floor linen closets, mop and janitor’s closets, service lobbies and service stairways, function rooms, shopping arcade, cabanas, bars, dining rooms, offices, uniform rooms, tailor rooms, upholstery, shops, store rooms and swimming pools. Bed making is a skill that requires to be developed by the housekeeper, as it not only provides comfort to the guest, but also adds to the pleasant ambience of a guest’s room. This involves all functions from purchase of linen to laundering, storage, supplies and to condemnation. In a hotel different types of clothes and linen are used such as the bed sheets, pillow covers, napkins, towels, hand towels, table covers, curtains, cushion covers etc. The relationship between the housekeeping and laundry is significant for the smooth functioning of housekeeping services. Pest Control is another major job of the Housekeeping Department. It speaks badly of a hotel where one sees rats, cockroaches, and lizards running around. Therefore, pest control is one of the primary responsibility of the housekeeping department. The room keys have to be handled efficiently and safely before and after letting the room. If the guests and staff always fear for their safety and the safety of their belongings, the atmosphere will be very tense. Hence the housekeeping department staff should be aware of ways to protect himself and others, especially the guests around him and the property of the hotel from accidents and theft. These arts and crafts have to be well maintained by the housekeeping department. Decorating flowers is a creative and stimulating art which often carries a message or theme. Flowers and indoor plants add colour and beauty to a room. Room Maintenance: Good housekeeping department is just as responsible for the hotel's maintenance as an engineering department. • Ensure conformance to policies and procedure as laid dawn by the management. • Manage staff scheduling as demanded by room occupancy forecasts and the banquet functions. • Ensure that the staff is properly groomed and correctly uniformed. • Check all the public areas and rooms and see that the standard of cleanliness is maintained. • Prepares duty rosters for the staff. • Co –ordinates with the purchase manager for purchase of linen. • Co- ordinates with human resources department regarding the recruitment of staff. • Supervise the staff working under her. • Training of new recruitment. • Set up par stock level and sanctions for uniform. • Reports to the general manager of the hotel regarding the happenings of her department. • Checks the working of the equipments. • Hold meetings of the housekeeping staff. • Prepares polices concerning housekeeping. • She acts as an executive house keeper on her absence. • Assists the executive house keeper on daily functions. • Supervises the staff working under her. • Helps the house keeper in preparing duty roaster. • Physically checks the areas to see that they are cleaned up as per the hotel standards. • Trains the staff working under her. • Checks the staff working under her. • Checks the occupancy report. • Checks the room attendants report. • Assigns duties to the room attendants. • Responsible for the cleanliness and the upkeep of the assigned floors. • Ensures the supply of guest amenities to the rooms. • Maintains records of all room linen. • Reports maintenance to the house keeping control desk. • Assigns duties to the house men. • Responsible for the cleanliness and the upkeep of the public areas. • Reports for maintenance to the control desk. • Prepares job order forms. • Supervises pest control activities. • He listens to the guest complaints. • Prepares housekeeping report; a copy of which is sent to the front office. • Co-ordinates with the maintenance department. • Prepares job order form. • Controls the movement of keys. • Enters lost and found items. • Co-ordinates with all the staff of the department. • Maintains log books in the desk. • Controls and checks up the soiled and fresh linen and uniform to and from the linen room. • Issues linen and uniform to the staff. • Controls the linen room. • Checks the linen stock periodically. • Cleans the assigned floors. • Fills up day to day guest compliments and supplies. • In charge of service trolley. • Helps in preparing occupancy report and room attendant report. • Replenishes service trolley with guest supplies, delegate linen, etc. • Responsible for cleaning all public areas, outlets & executive office. • Responsible for all heavy works in housekeeping department. • Involve in post control activities. Gardeners are responsible for maintaining all gardens in the hotel. The days have long gone when housekeepers were characterised by their hard and soft brooms or by the functions of sweeping and mopping. In fact, if anyone was seen sweeping or mopping in a hotel, people would automatically associate him with the housekeeping department. Moreover, the main role of a housekeeper in earlier times was to keep the property neat, clean and hygienic. The role of a housekeeper has changed rapidly with the changing times. Apart from the cleaning, maintenance and aesthetic upkeep of the property, the housekeeping system in itself has been computerised. A majority of the staff who were earlier illiterate are now diploma holders with technical qualifications, All fluent in English and working on shop floors and doing basic jobs in the hospitality industry. Housekeeping control room jobs, too, which were earlier manual, are now completely computerised. Nowadays rooms, amenities and supplies are also modified from hotel to hotel, While keeping in mind the guest profile. Modern rooms are spacious with tasteful decor and are well-equipped with many facilities, Apart from the changing room scene, housekeepers today are well-versed, not only with their jobs, Take care of horticulture, laundry operations, interiors, quality control, cost control, and the comfort and satisfaction of guests. Today, most complaints are forwarded to the chief housekeeper and sorted out with the housekeeping staff. Only major complaints reach the front office/general managers. Apart from this, housekeepers also do purchasing for exclusive items for special occasions. In many hotels, housekeepers also assist the sales team to generate revenue. 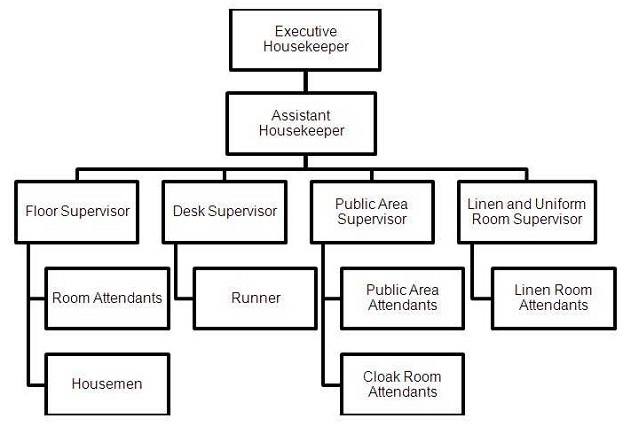 Today's housekeepers have experience, skill as well as knowledge to run the Rooms Division. Therefore, the housekeepers' main role in every organisation is to preserve the building decor, its interior, fabrics and furniture. Planning, men management, recruitment and training as per expectation of the management, along with controlling costs and keeping records. In modern times, housekeepers also employ R&D for the betterment of their company. In addition, housekeepers also play the role of HRD managers for their staff, endeavoring to solve their individual grievances/operational problems within the four walls of the department concerned, before the matter gets out of hand. This is because good housekeepers always consider their staff assets to the organization. At last as the scope of a housekeeper increases, there are a lot of challenges to be encountered simultaneously. The first factor in this respect stems from the very same understanding that the staffs are the main asset for their department. In order to ensure guest satisfaction with zero complaint, a housekeeper has to train and motivate staff accordingly, during brain storming sessions. Apart from that, maintaining the hotel's standards, preserving the building and its decor as well as fabric and furnishing are some of the other responsibilities. To successfully run the housekeeping department, housekeepers have to keep their budget in mind at all times and deliver the best results without any excuses. With increasing competition from new hotels, housekeepers on a daily basis have to ensure that there are no complaints; interact with guests as well as internal customers in order to get daily feedback. This is a challenge restricted not only to housekeepers, but other heads of departments, in other facets of the hospitality industry as well. And at the end of the day, there is no job surety either, in this industry. An individual has to keep delivering good results, consistently meet standards and work effectively within the budget. Housekeepers, on the other hand should have good communication skills and be effective team leaders and trainers, having wide knowledge as well as keeping an eye out for detail. The role of housekeeping is to keep a clean, comfortable and safe house. The house keeping department in a hotel is responsible for the cleanliness, maintenance and aesthetic upkeep of the hotel. The house keeping department takes pride in keeping the hotel clean and comfortable so as to create a home away from home. A hotel survives the sale of rooms, food and beverage and other minor operation services such as laundry, health club, etc. It is responsible for supply of liner and uniforms to various other depts. and to the rooms. It is the responsibility of housekeeping personal to offer it within the budget if not it reveals the inefficient mgt and operations. The housekeeping is the department of a hotel charged with cleaning and maintaining rooms and public spaces. From the time a guest checks-in in a hotel till he checks out, it is the housekeeping department which takes care of the guest by making his / her stay pleasant and comfortable. In general, the housekeeping crew is responsible for the daily cleaning of public rooms (lobbies, corridors, meeting rooms), private bedrooms and public washrooms. In addition, it handles the laundering of linens and in some instances, guest laundry. Housekeeping also performs a minor security function by providing a “first alert” to potential guest problems while staff undertake daily guest bedroom. 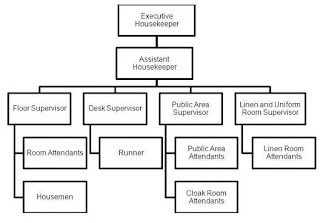 The organizational structure of the housekeeping department mainly depends on the activities and the size of the hotel. Responsible and accountable for the total cleanliness, maintenance and aesthetic upkeep of the hotel. The hotel staff are all practically in uniforms his / her task is enormous and demanding as h e / she has to keep an inventory control on various stages of use, such as, when sorted ones are handed over, or those which are being washed or dry-cleaned in the laundry. who actually do the issue of uniforms in e x c h a n g e f o r soiled ones for onward transmission to the laundry. His job is a mammoth task because he keeps track of all linen as they would number in thousands. Assists the supervisor by actually issuing linen and filling such records as necessary. Tailor or seamstress personnel are responsible for stitching and mending t h e linen and upholstery’s. They are to be found both in Uniforms and linen Rooms and do the physical work of transporting, counting and bundling of uniforms and linen. Supervises the work allotted to Houseman, especially those in public areas. In medium sized hotels he could be the person in charge of housekeeping on night shifts. Usually handy men who do the heavy physical cleaning required in guest rooms and public areas. The Housekeeping Desk must be manned 24 hours as guests and staff will contact this desk to transmit or receive information. He is a person who goes from one guest room to another collecting or delivering guest laundry. This is a service provided by superior hotels in cold climates. They handle all aspect of housekeeping at night including desk control operations, issue of linen and uniform in an emergency, etc. Horticulturists, who maintain the gardens of the hotels as well as supply flowers from the garden for interior decorations and floral arrangements,. Does the actual digging, planting, watering, etc.